Storyboards raise the visual bar. Projects that include a storyboard are more likely to side-step the blunders that can result from miscommunication during production. In this post, we’ll discuss the latest storyboard software, storyboard apps and iPad styli. Plus we’ll provide you with a bundle of free storyboard templates. Let’s get started. There’s a variety of storyboard software on the market, ranging from software with preset characters to professional storyboard software that requires drawing skills. You can find everything from traditional licensed software to web-based solutions to mobile apps. Alternatively, you can download your own printable storyboard templates below. StudioBinder is an intuitive, online storyboard software solution. It provides robustness and ease of use to fit most creatives. Simply upload images and you've got a storyboard! 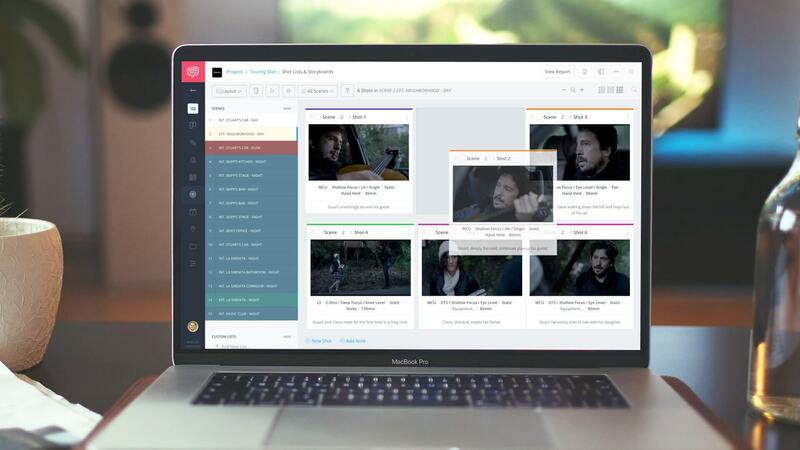 Customize the layouts, shot list details, and aspect ratios. You can also view your storyboard as a fullscreen slideshow, which makes it ideal for presentations. StudioBinder's storyboard software features are free to use up to a certain number of panels per project, and just $29/mo to fully unlock it. Also comes bundled with shot list software and more. Out of the UK comes Moviestorm. Promoted as “a filmmaking tool for everyone,” so you don’t need to be an artist. You can create everything from storyboards to full pre visualization, and various theme-based add-ons provide additional robustness. FrameForge offers various bundles, each with increasing complexity and price points. All levels include optically accurate virtual cameras. The highest-end packages allows users to define exact equipment specs for dollies & cranes, precise lighting, calculations for sun positioning, reports and more. On the iPad side of things, ShotPro is a solution to easily create storyboards or pre-visualization. Add a structure sensor and you can scan real-world objects, locations, and people to import as 3D objects into your storyboard. That’s pretty slick. Power Production provides a few storyboard solutions, each with varying complexity. It offers customizable characters and presets for locations and props. They offer script imports, character animations and other integrations. Price: Power Production’s software starts at $190 for Storyboard Quick while the more robust StoryBoard Artist Studio sells for $900+. StoryBoardPro is another web-based solution that does not require any drawing or sketching skills. You can build a scene by importing videos, photos and sounds, and add notes on individual frames. StoryBoard Fountain is one of the newer players in this space. This web app has a modern user interface, and focuses on going from script to visuals via sketches (using your mouse or Wacom pen). The beta app looks quite sharp, is open-source and available for free. Storyboard Composer relies entirely on the use of existing photos or video so there’s no need for drawing or sketching skills. It’s easy to add arrows and boxes to identify the movement of shots, and even animate them. It could also double as a solution for creating mood or vision boards. Storyboard That is not specifically for the film industry, but it can do the job. You create your own characters using a web interface and also doesn’t require any hand-sketching to get started. You can create storyboards for free but they will be publicly available. StoryboardPro is a professional web application from Toon Boom. Tailored specifically for commercial storyboards artists, the software includes animated and live boards with all the bells and whistles a serious storyboard artist would need. This is a combo solution. Boardo is an After Effects plugin for adding cool storyboard animations and effects to existing images, but you’ll need to create your images in outside software. We recommend using vector-based drawing apps on an iPad such as Paper (free), Astro Pad ($30) and Noteshelf ($9). Afterwards, you can combine the finished sketches in After Effects/Boardo to create animated boards you can export as videos. Make Storyboard is an assembly software that allows you to organize your images and sketches. They can be shared and commented on, and can be used one many devices including smartphones and tablets. If you already own Adobe Photoshop, consider sketching out your scenes and overlaying them on actual pictures. You can create tons of different storyboards types in photoshop, and then use an assembly program to organize and share your shots. Clip Studio Paint is a graphic design software that is generally used by illustrators and comic artists. You can draw some serious images and then color and stylize them to your preference. You can then assemble these illustrations in the software. OpenToonz is a software for producing 2D animation. You can draw illustrations in stunning detail, and add effects to them later if you so desire. This software has no copyright restrictions and can be used however you like including for commercial work. TVPaint is a 2D animation software that allows you to draw and stylize your storyboards. You can also upload and share them with your team. They also provide training courses that teach you how to use the software. Used by professionals and schools. Paper is an immersive sketch program. You can sketch, draw, and diagram with 3D journals. You can use gesture-based navigation to quickly move through the program. They have a free version or a 6-month subscription. Penultimate is a handwriting app developed by Evernote that allows you to stay paperless. You can use this software to sketch out basic storyboards and send them into Evernote or, use an assembly program to organize and share your shots. Artemis Pro allows you to not only organize storyboards but change aspect ratios. There is a set of preloaded “looks” that allow you to color grade your storyboards for different scenes and shots. Astropad allows you to use your iPad to draw directly into Photoshop and any other Mac creative tools. You can use this with your smartphone as well. Draw quick storyboards, or go into more detail, then use an assembly program to organize and share your shots. Weird name, cool program. Procreate is a sketching, painting and illustration app designed for mobile devices, and built for creative professionals. It has continuous auto-save and 136 brushes with 50 customizable features. Cinemek Storyboard Composer for iPhone and iPod Touch is a mobile storyboard and pre-visualization composer designed for anyone who wants to visualize their story. Get photos and then add traditional storyboarding markups such as dolly, track, zoom and pan. Shot Designer attempts to combine Camera Diagrams, Shot Lists, and Storyboards by to give you a satisfying understanding of camera-blocking. Animate characters and cameras with simple Walk To and Track To commands. Create sophisticated tracking shots too. Camera-Storyboard is an interactive scene layout tool for planning photo and video shoots. Create a new document based on an overhead image and add scene objects right on top of the original image. You can even graph the sunlight throughout day. No matter which software you go with, there’s nothing that can beat the precision of drawing a sketch by hand and importing the results. If you have an iPad handy (no pun intended), we suggest purchasing a stylus for sketching your storyboards. Here’s our top 10 picks for best styli for storyboard artists. All of these were designed for iOS devices and all include palm rejection options. Quickly becoming the standard stylus for professionals. Seamless use with Apple products. Press harder for thicker lines, lighter for thinner ones. Create shading simply by tilting. Built in palm rejection so that you can rest your hand during use. Great stylus. Rechargeable Polymer Lithium battery. No bluetooth pairing or app required. Works with ZoomNotes, Evernote, Paper by FiftyThree, ProCreate, and many more. Good battery life, accuracy, and reliability. Bluetooth, pressure sensitive fine tip for natural, precise and authentic sketching. Slim and lightweight carrying case that fits your pocket (includes storage for the pen, extra nibs and the USB charger). Two customizable shortcut buttons and two exchangeable pen nibs. precision disc creates a precise contact point with the screen. Engineered into one piece for added stability. Magnetic cap snaps on for protection. Textured grip etched onto the barrel. No batteries required. No pairing is needed. Works with iOS and a broad range of Android devices. Flick the side switch to the upper position for most tablets, and to the lower position for iPad Pro. Designed for daily use, built with high-quality materials. Click-on without the need for bluetooth. 14 hours of continuous use, and charges within 45 minutes. 1.9mm tip creates a paper-like drag that's more precise and responsive. A digital brush and a stylus for devices like the iPad and iPhone, Samsung Galaxy and most other touch screen devices. Touted as being the most accurate “brush” tool. Literally transforms from a stylus to a digital brush with ease. Cool product. Plastic Carrying Case Included. Synthetic Brush Tip For Soft, Flexible, and Improved Feedback. Removable brush tip and cap can be interchanged. Hand crafted from precision-milled aluminum parts. If your storyboards will not be client-facing, sometimes the best option is to print out your own storyboard template and sketch it by hand. Even stick figures can go a long way in visualizing and planning a scene with your DP/AD. Remember shooting boards only require a rudimentary drawing skill level. Because it’s the framing, action, camera movement and direction that matter most. Need a printable storyboard template? We’ve got you covered. We’ve created over 10 premium storyboard templates to fit pretty much any use case. Click below to download the free storyboard templates. Here’s a video from Indy Mogul, covering the basics and importance of storyboards and shooting boards with examples from a short film script. Once you receive your storyboard from an artist, make sure to include a copies in your final production wrap binder. Storyboards and revisions can be easily backed up and shared electronically these days with file sharing solutions like Dropbox or Hightail. If you’re looking for a more A-to-Z production management solution, StudioBinder makes it easy to manage your production files online, in addition to managing crew, creating schedules, and sending out call sheets. Plus it’s free to get started. Where to find storyboard artists for any budget? That’s the basics on storyboard software and templates. We hope you found this post and the free downloads helpful. Now, if you have decided the sketching is a little too much and you want to hire a storyboard artist for a more polished presentation, check out our article on Websites to Find & Hire a Storyboard Artist. What storyboard software do you use? Did we miss anything? Leave us a comment below.